Following a series sweep of Jackson State, the No. 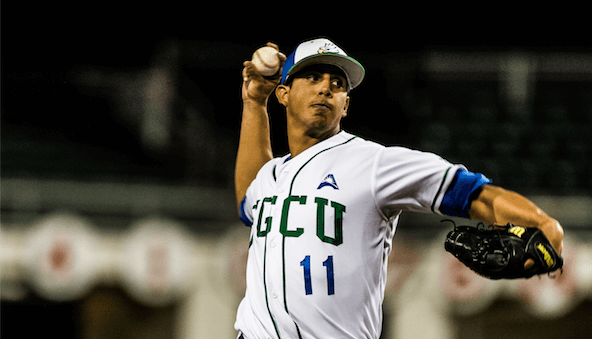 9 FGCU baseball team defeated Miami 3-0 thanks to a strong performance on the hill by Mario Leon. The Eagles have now completed a sweep of the big-three Florida schools with wins vs Miami, Florida State and Florida. They’ve also beaten USF and FAU to sweep the state of Florida. Mario Leon, who has been called upon to pitch in the midweek games, threw his best outing of the season, going seven innings, two hits and giving up no runs in front of a Swanson Stadium record 2,074 fans. Julio Gonzalez broke a scoreless game in the seventh with a two-run single with the bases loaded to give the Eagles a 2-0 lead. The Eagles went up against freshmen right-hander Gregory Veliz. FGCU had a chance in the first inning with the bases loaded and one out, but Veliz was able to get two fly outs to end the inning. Veliz went on to retire nine in a row before Spencer Levine singled in the fourth. The pitchers matched zeroes until Gonzalez drove in two in the seventh. Nick Rivera added to the Eagles’ lead with an RBI double to put FGCU up 3-0. With the Eagles ahead by three runs, Kenton Herring came into the game and struck out two in a scoreless eighth inning. Sterling Koerner matched Herring’s performance on the mound, striking out two in the ninth and getting Carl Chester to ground out Gonzalez to end the game. FGCU now will get ready for conference play when they welcome in Jacksonville on Friday night for the start of a three-game series. Catch Mario Leon on the next episode of ENTV’s Beyond the Nest on eaglenews.org. Friday, March 31.